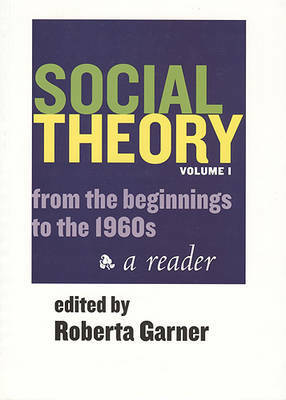 " Roberta Garner's successful Social Theory: Continuity and Confrontation is still available in a two-volume format, divided as follows: Social Theory, Volume I: From the Beginnings to the 1960s Social Theory, Volume II: Power and Identity in the Global Era Social Theory: From the Beginnings to the 1960s offers students substantial selections from the classic texts alongside unusual and thought-provoking examples of theory in action. The organization of the reader and Garner's short introductions to selections enable students to understand the historical flow of social theory, trace continuities in theory, and see how disagreements and confrontations shape theory. Her introductions, written in clear, down-to-earth language, highlight links among theorists. She shows that theoretical traditions are not rigidly separated from one another, but are always in conversation?addressing and challenging each other. She discusses how changes in society bring about changes in theories and notes the relationship between theories and research methods. Attention is given throughout the book to counter-currents as well as mainstream social thought. Designed to be easily read in conjunction with most theory texts currently available, the book contains selections which are drawn from the works of classic theorists including Niccolo Machiavelli, Edmund Burke, Karl Marx, Emile Durkheim, Max Weber, Georg Simmel, George Herbert Mead, W.E.B. DuBois, Walter Benjamin, Antonio Gramsci, Talcott Parsons, C. Wright Mills, and others. Roberta Garner received a PhD in Sociology from the University of Chicago. Currently she is a professor of Sociology at DePaul University in Chicago. She is the author of Contemporary Movements and Ideologies (1996) and Social Movements in America (1972)."